Hatch Chile Roastings 2013 in So Cal — It’s Hot Out There! Put your nose in the air and sniff! Authentic Hatch Chiles from New Mexico are in season right this minute, and are here in Southern California. If you’re a Hatch head, you already have it marked on your calendar. 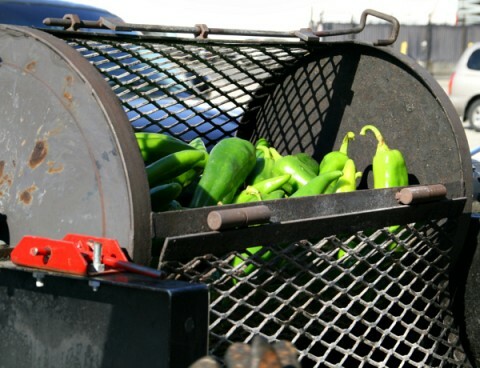 If you’re not yet a Hatch head, take note of the following dates (Aug. 10-Sept. 14) , times and cities where you can buy a big box of Hatch and have the chiles roasted for you on site. Roasting is free with a case order. The chiles are here now, but will be gone in September, so get ‘em while the gettin’s good. Of course you can buy them and roast them yourself (it’s not difficult with my directions on how to roast Hatch ), but really, the fun is in hanging around the parking lot while the huge bingo cage-like roaster spins over an open flame, chatting up others in your tribe, swapping recipes and tips. Go here for more information about the Bristol Farms’ Hatch chile roastings  and go here for more info on Hatch chiles from Melissa’s Produce . 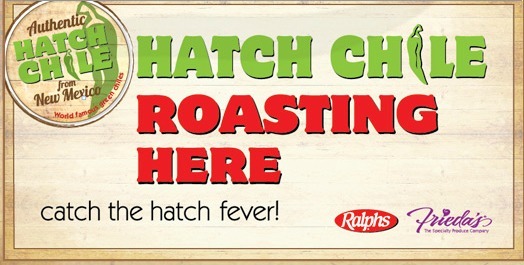 In partnership with Melissa’s Produce, Sprouts will feature Hatch roastings on the following dates from 10 a.m.-2 p.m.
Go here for more information about the Ralphs Hatch chile roastings with Frieda’s .